Using only your own hair we create amazing, natural dreads to whatever size, shape, style or structure you want without any sticky wax, nasty chemicals, mess or breakage with little shrinkage. 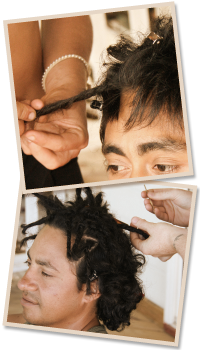 You have complete control over the style and shape of the dreadlock as well as how and where they sit on your head. We use our own hands in a splitting and knotting technique to give you a basic, loose, fluffy dread, then a crochet hook to bring in all the loose hairs and to tighten and neaten the dread. The final product is a neat, tight, permanent dread that looks instantly locked and fixed and requires no products or rolling. We specialize in 100% natural dreads but we also offer extensions (in either human or synthetic hair), for extra length, body or width. Infact, if you have over 5-10cm of hair but you want even longer dreadlocks right away we can give you an instant head of long dreadlocks to whatever, style, size, shape, colour and length. The more damaged your hair is the easier it will dread so lay off on the conditioner and swim heaps in the ocean. Healthy, well maintained hair will still dread but may take more time. For all new dreadlocks including extensions there is a $150 base charge, then you pay the hourly rate. The hourly rate is $70 per hour on weekdays and $90 on weekends/public holidays. Shoulder lenght hair usually takes 3-5hrs, below the shoulders 4-6hrs and long hair 6hrs plus. Time varies according to hair-type and thickness, the structure and width of dreadlocks you choose. The standard method of making dreadlocks (backbrushing and waxing) is painful, time consuming, often expensive and takes a lot of time and effort on your part. Your dreads are not instant and can often take a year or two of rolling and waxing to tighten and neaten. Ultimately, (unless you obsessively palm roll) you never know how much your dreads will shrink and widen and what style or shape you will end up with. Wax is sticky by nature and attracts dirt and fluff (giving dreadlocks a bad name). Sometimes the dirt and fluff lodged in waxed dreads doesn’t dislodge for years (if at all) giving your dreads a dull, grubby, greasy appearance. Further more, wax blocks the pores in your scalp which means your skin can’t breathe and it gets on everything!!!! Your face, hats or scarves, pillow slips, helmets, clothing and couch. Another common method of making dreads is to wrap them in pipe cleaners and drench them in perming solution (a toxic chemical). This solution (especially when overdone) can break your hair right off, damage your scalp and stay lodged in your dreads and close to your skin for a long time. 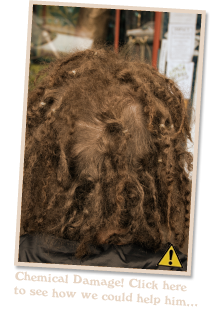 Chemical induced dreads often never achieve a lustrous, full bodied, natural appearance. 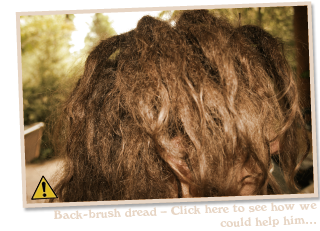 In our experience with dreads we have seen desperate measures…dreads saturated with honey, coconut milk and iced tea, staples, rubber bands, glue from a hot glue gun, surfboard wax, string and wire, bleach and ash, clay and sand. Its no wonder dreads have a reputation for being dirty, messy and high maintenance. Why put up with all this when you can have instant, natural, clean, perfect dreads with less cost, time and trouble? E-mail us today and get it done 100% naturally and professionally! WARNING: For all soon-to-be dreadlocked enthusiasts!!! The appearance and workload of your dreads for the next years to come is hugely dependant on how you have them made. We recommend avoiding the following ways!